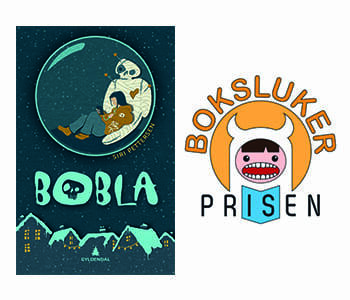 Hurray for Siri Pettersen and BOBLA, shortlisted for the Avid Reader Award (Bokslukerprisen) 2018/19. 80,000 students (the highest number of participants ever) in 5th and 6th grade in Norwegian schools have read and selceted the super finalist to the award which will be handed out at a ceremony at Sentralen in Oslo 24 April 2019, an event within the celebration of the World Book Day. The Avid Reader Award (“Bokslukerprisen”) is a reading incentive award for 5th and 6th grade students, focusing on the joy of reading. The first award ceremony was arranged in 2014. The participating classes receive anthologies of Norwegian novels written for the age group 10–12. Students read and vote for the best excerpts. The top five excerpts constitute the nominees for the award. Five jury classes from across the country are assigned to read the nominated excerpts and to select a winner. During the reading period, jury classes are visited by a motivational speaker, who gives the students guidance on how they can become critical readers and how they can justify their opinions.